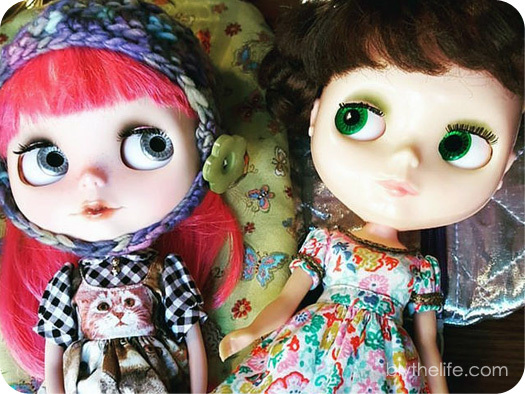 I do not often take my dolls out of the house unless I’m going to a Blythe meet (or a BlytheCon, although that doesn’t happen often), or meeting up with a friend who happens to collect dolls. I don’t take part in those photography challenges that suggests you to take photos of your dolls in a grocer store or on the sidewalk of a busy intersection. I can be terribly self-conscious when it comes to bringing my dolls out in public. As open as I am or can be about my Blythes on the internet, it’s not exactly the first thing I tell people about myself. I don’t open an introduction with “Hello, my name is Michelle and I collect dolls”. Mostly because I think people will think I’m weird or they think dolls are weird. I don’t think movies like Annabelle or The Boy have helped at all to quell the suspicions that some people have that dolls are just weird (or scary). But most recently, I took Cameo out with me because I was meeting up with Pamela of Endangered Sissy. We did some shopping and then had drinks at a small hole-in-the-wall cafe. Having someone else have a doll out helps, I think, make you more brave about pulling a doll out. That and the realization that yes, people see your doll out, and no, they’re not making comments about it. As with many things, I think it’s a “safety in numbers” mentality that I quite enjoy on a regular basis when taking dolls out in public because having other people around helps a lot to make it seem safer to pull a doll out. Do you take a doll out when you’re by yourself, or do you feel better about having a doll out when other people also have their doll out? Does it matter to you what kind of setting you’re in? Share below! And if you were also as nervous as I am about taking a Blythe out in public, how did you get over that? QOTW: Are you taking a doll on vacation this summer? In Europe and here in Canada I usually feel ok about that. People are less likely to break the privacy borders. I usually feel safer when I look really good. It gives a kind of a glam or hipster feel and transforms a doll into a fun and fashionable accessory. 🙂 But I still cannot get rid of fear of kids’ reactions (to be more precise, of the exact fanatic moms or grannies that may be encountered). I heard collectors complain about the attempts to make them share a dolly with a baby, don’t be selfish, hey, dat’s just a toy! Luckily it doesn’t happen to everyone. But still I nervously hide the toys when I see a family with kids in the street 🙂 Also, in all circumstances I feel uneasy about explaining that there ARE toys that are not meant for kids. A lot of people outside the hobby seem to put all their force into ignoring this fact. A doll is always for a kid, even if that’s a 10000$ porcelain art doll. And that’s a bad doll, yes, because its design is not suitable for a baby! Montreal is a very free and democratic city, there are numerous creative people, eccentric fashionistas and impressive freaks of all kinds. I think very few people simply pay attention. I am also a part of Urban Sketchers movement and recently I went to a large art expo with crowds of people. I sketched the exhibition parts for about an hour and a half, moving from one location to another, and no one has ever said a word! No comment or question! I sooo love that. Way back when I first got into Blythe, I was too afraid to take dollies anywhere. That changed at the first Blythecon. I don’t know if it was the kinship of us all being there together or maybe just stopping traffic while we were taking photos, but, I had a dolly in my purse the next day! I will take my doll out on my own, because I was an art major in college, and had to take some “Performance Art” classes (where you have to “do” something as art)… which I was incredibly uncomfortable with, but which made me go out in public and do very strange things… so I kind of got used to people just wondering what I was up to, or why I was carrying something strange. I haven’t taken my dolls out and about very often at all. I have taken one to a ComicCon, and had a lot of folks in cosplay pose with her for pictures, which was great fun! I think I felt that it was a little bit of a safer space because theoretically other ComicCon-goers understand that many toys are expensive and fragile and to be treated with care. I do also have a fear of damaging a girl myself while carrying her from one place to another, which has also held me back from more public outings. I love taking mine out, my neighbourhood expects me to do something to occupy myself (this is Portland after all) like crocheting outside and having tea at the corner cafe, or taking my girls out. My neighborhood has a little “elf” land set up in the front yard of a house next to a daycare center which freaked me out at first until I met the couple who were two old retired kindergarten teachers of 60 years. So I love to take my dolls there and take pictures because of the fun setup with miniatures and little tree houses that are perfect for Blythe. My boyfriend (who the night we met fell in love with my doll…I knew I had a winner!) got one of his own that he takes out too.